Prince Ranieri, Duke of Castro, died on 13 January 1973 at his home, Saint-Sauveur Castle. Some years earlier in 1966, Prince Ranieri had passed all his functions as Grand Master of the dynastic orders of the Royal House to his son HRH Prince Ferdinand, (de jure, Ferdinando IV), Duke of Castro and Head of the Royal Family of the Bourbon of the Two Sicilies. His late Royal Highness was born in Podzamcze, Poland, on 28 May 1926 and was the first member of the Royal Family to serve in the French Armed Forces. In 1949 Prince Ferdinand married Chantal, of the Counts of Chevron-Villette. 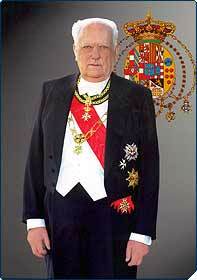 On 20 March 2008 in Draguignan, France, HRH Prince Ferdinand died and was succeeded by his only son, HRH Prince Charles of Bourbon Two Siclies, as Duke of Castro and Head of the Royal House.